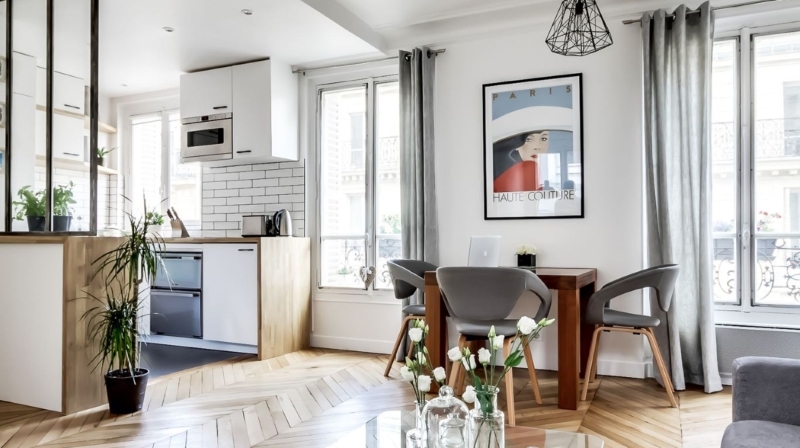 This cool little flat is in the 8th arrondissement of Paris, clocking in at only 38 square metres. 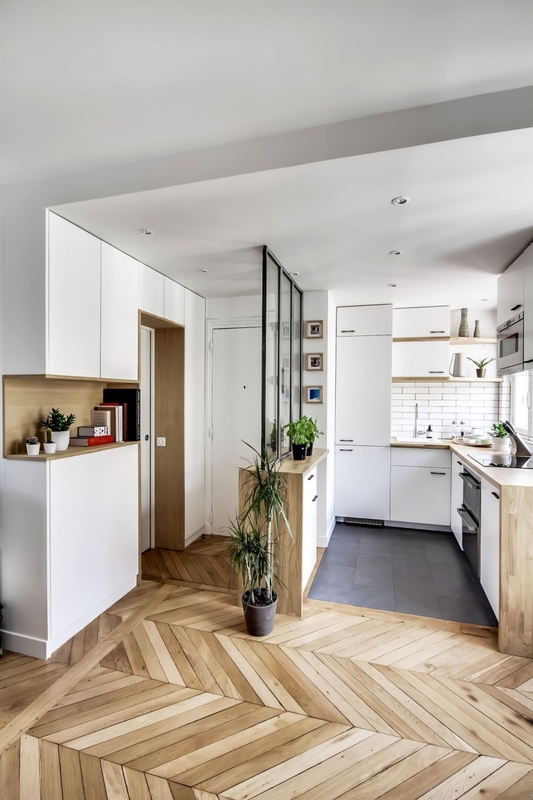 If you're not impressed, a quick search on Google will give you an idea of what this size of floorplan usually looks like - check out this flat in Bordeaux and this one in Poland. They're absolutely tiny! The interior designer, appropriately named Pierre Petit, cut down on the 'technical' areas of the house - such as the kitchen and bathroom - to maximise space in the living room and bedroom. He's left a lot of unused floor space in the middle of the living room, but rather than being wasteful this actually helps open up the flat and give it a bit of breathing room. 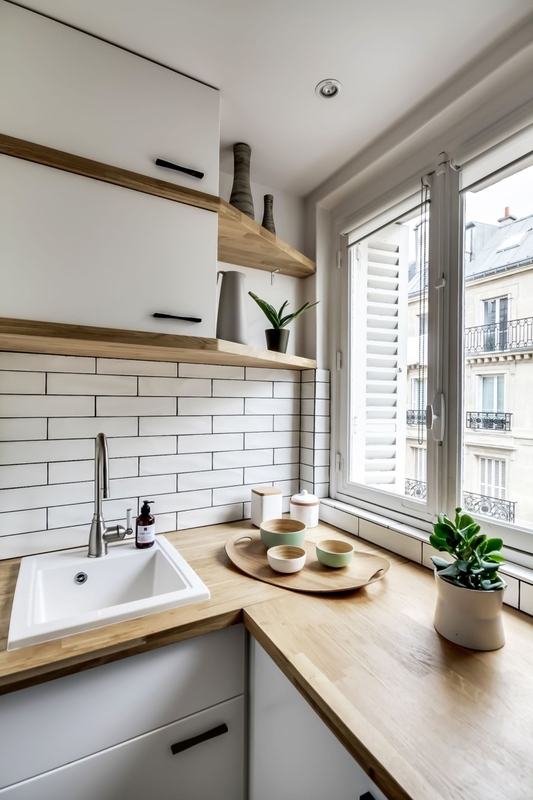 The kitchen is undeniably tiny, as is the dining table, but looking at it I can't really see that either of them are crying out for additional space. The use of glass in the kitchen is really helpful, allowing you to see out across the flat or down into the street below while you cook rather than staring at a brick wall. The floor-to-ceiling storage in the mini hallway would be a godsend - the last thing you need here is to cram in additional pieces of furniture. The ledges are a thoughtful touch too - it's important to have somewhere to dump your keys/wallet/phone as you walk through the door. The only thing I'd be tempted to change is to put hinges on the glass screen to make it retractable, so that I could open up the space a bit more when throwing a party. Then again, you'd probably have to use quite lightweight materials and it might end up looking like a shower door...! Subway tiles in the kitchen, solid wood counter tops and a herringbone floor finish everything off really nicely. Oh, and the counter fronts are from IKEA! So if you don't fancy moving to Paris, it wouldn't be hellishly expensive to recreate this at home. All images courtesy of Côté Maison.